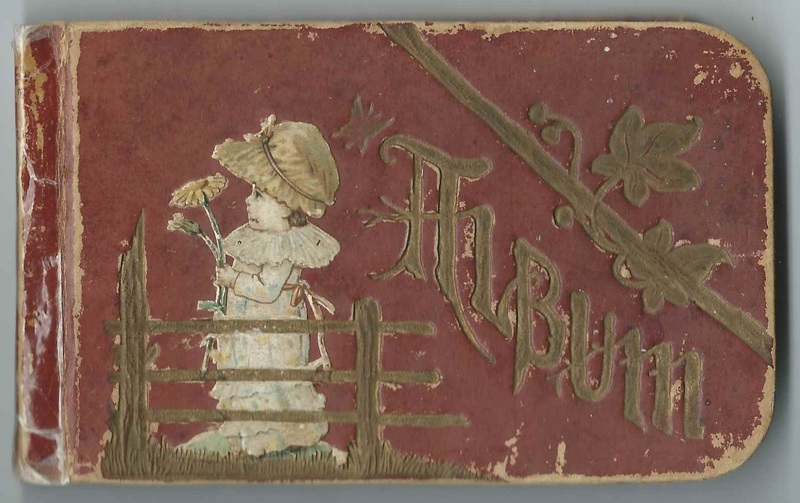 Autograph album that student Stella Harris commenced on February 14, 1889; perhaps a Valentine's Day gift. Stella was presumably Estella Harris of Modesto, Illinois, daughter of Sidney Thomas Harris and Susan Elizabeth (McPherson) Harris. The album measures approximately 5" by 3" and contains the sentiments of 23 of Stella's relatives, friends, schoolmates and teachers. An alphabetical list of the surnames mentioned in the album and an alphabetical list of the inscribers, together with any personal information they offered, appear at the end of this post. According to her California death record, Estella Harris, "Stella", was born January 1, 1882 in Illinois, and died in 1944 in Los Angeles, California. However, her Find a Grave memorial indicates she was born February 26, 1881; she's buried in the Waverly East Cemetery at Waverly, Illinois. Stella, the daughter of Sidney Thomas Harris and Susan Elizabeth (McPherson) Harris, is listed as Estella Harris in a 1901 University of Illinois (the Urbana-Champaign campus) publication. Since Stella was buried at Waverly, Illinois, I'm assuming she is the Miss Estelle Harris who started a movement in 1911 for the establishment of a Carnegie Public Library at Waverly. Two of Stella's sisters, Emma and Eunice, inscribed pages in her album in 1889. A cousin, Susie, inscribed a page on June 12, 1889. Two of Stella's teachers inscribed pages. They were Emma Maxwell, who inscribed a page in 1889, and Katie Fanning, who inscribed a page in 1891. Paul Wilcox; inscribed in May 1890; Stella's schoolmate: "Remember our fun of 1890"